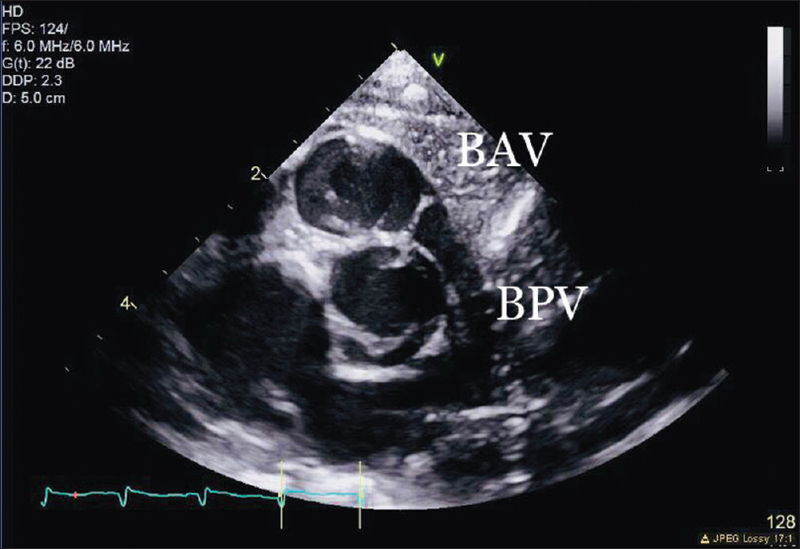 Bicuspidity of both the semilunar valves is rarely reported. We report the first ever case of bilateral bicuspid semilunar valves in a case of transposition. The bicuspid aortic valve is a common congenital anomaly, having an incidence of from 1% to 2% in the general population. Bicuspid pulmonary valves, in contrast, are very rare, having an incidence of only 0.1%. The bicuspid aortic valve is commonly seen in association with left-sided heart disease but has rarely been reported in the setting of transposition, defined on the basis of concordant atrioventricular and discordant ventriculoarterial connections. The presence of both arterial valves with two leaflets is exceedingly rare. To our knowledge, such a finding has been reported only in postmortem studies and in few isolated case reports in the setting of concordant ventriculoarterial connections. We report here a neonate with bicuspidity of both arterial valves in the setting of transposition. A male neonate was transferred on prostaglandin E1 infusion on the 1st day of life to our facility after he failed the critical congenital heart screen. He had been born at term and weighed 2.68 kg. Physical examination revealed a patient small for gestational age, with mild dysmorphism. There was posterior sloping of forehead, a mildly depressed nasal bridge, and low-set ears. Cardiac examination revealed normal rate and rhythm. A systolic ejection murmur graded at 2 from 6 was heard at the cardiac base. All pulses were palpable and strong. 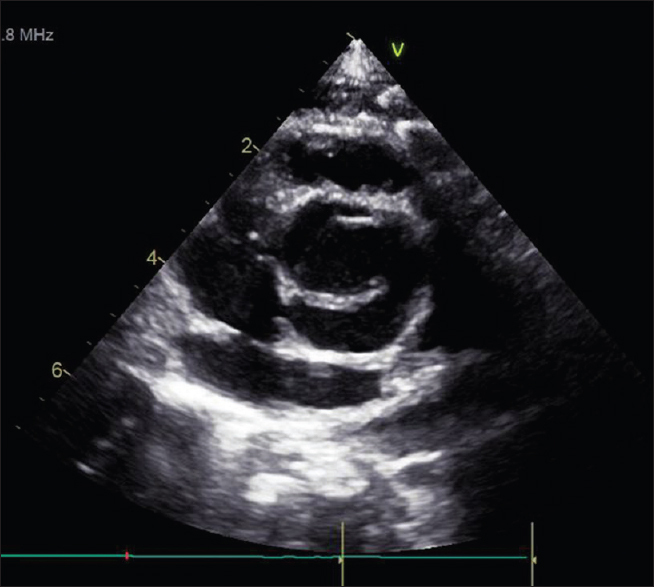 Cross-sectional echocardiography revealed usual atrial arrangement with concordant atrioventricular connections, right-handed ventricular topology, and discordant ventriculoarterial connections, with the aorta positioned anterior and rightward relative to the pulmonary trunk. He was found to have both aortic and pulmonary valves with two leaflets. The pulmonary valve annulus, measured at the level of the virtual basal plane, had a diameter of 12 mm, with a Z-score of 2.32. The comparable value for the aortic valve was 9 mm, equating to a Z-score of 2.83 (Boston Z-score) [[Figure 1] and Video 1]. The pulmonary valve was mildly thickened and domed in systole, permitting mild regurgitation but producing no stenosis. The zone of apposition between the two leaflets of the aortic valve ran from front to back, with one coronary artery arising from each of the valvar sinuses. The left coronary artery arose from the left-sided sinus, while the right coronary artery arose from the right-sided sinus. The left coronary artery then branched into the circumflex and anterior interventricular arteries. He had a tiny perimembranous ventricular septal defect, an oval foramen of moderate size, and a large persistently patent arterial duct. He underwent emergent balloon atrial septostomy and subsequently, on the 13th day of life, underwent an arterial switch operation, with ligation of the duct and closure of atrial septal defect on day 13 of life. Postoperatively, he has developed moderate insufficiency of the new aortic valve, with dilation of the sinuses and moderate dilation of the left ventricle [Figure 2]. The bicuspid nature of both valves was confirmed intraoperatively. The zones of apposition of the valves, however, were aligned, making it possible to transfer the coronary arteries to the adjacent pulmonary valvar sinuses during the arterial switch operation. In the early days of the arterial switch operation, a bicuspid pulmonary valve was considered a potential impediment to successful repair. With advancement in operative techniques, the switch procedure has increasingly performed in patients with bicuspid pulmonary valves. Although the bicuspid nature of both the aortic valve and the pulmonary valve have previously been described in the setting of transposition, we are unaware of any previous description of both valves being bicuspid in the same patient with transposition. During the 7th week of gestation in man, the arterial valves develop in the middle component of the developing outflow tract. It is the appearance of the intercalated cushions that herald the appearance of the developing arterial roots. The central parts of the major outflow cushions fuse together during this period of development, whereas the parietal parts remain unfused. It is then the interdigitation of the unfused parietal parts with the intercalated cushions that form the primordiums of the two roots. The leaflets of the valves then excavate from the distal ends of the cushions, which become populated by cells derived from the endothelium and neural crest., Valves with two leaflets can be the consequence either of the fusion between developing cushions and hypoplasia of the intercalated cushions. It is the latter mechanism that would produce leaflets having aligned zones of apposition. Various mechanisms have been proposed to account for bicuspid valves at a molecular level, such as deficiency of C-type natriuretic peptide receptor 2, loss of function mutation in GATA4 gene, and NOTCH1, GATA5, and SMAD6 gene. Linkage analysis of the genome-wide marker has demonstrated a linkage of bicuspid aortic valve to loci on chromosome 18, 5, and 13q. Bilateral bicuspid arterial valves have been noted in association with trisomy 18 and trisomy 13. Our patient, however, had normal chromosomal microarray. Bicuspid pulmonary valves are not uncommon in the setting of transposition, being reported at 4% and 7% in 2 large series., Such bicuspid valves are known to cause complications postoperatively with the need for replacement of the new aortic root. Others have shown, nonetheless, that in the short to mid-term, the arterial switch procedure can be performed with low morbidity and mortality in the setting of well-performing bicuspid neoaortic valves. To the best of our knowledge, there are no long-term data currently available. In our patient, in the short term, there is some dilation of the neoaortic sinuses, with mild-to-moderate valvar insufficiency. The presence of the bicuspid aortic valve does create potential problems in describing the sinusal origin of the coronary arteries, which is the basis of the Leiden classification. In our patient, nonetheless, the sinuses were located in the right- and left-sided locations, with each sinus giving rise to the appropriate coronary artery. We believe that we have reported the first case of bilateral bicuspidity of the arterial valves in a patient with transposition successfully undergoing the arterial switch operation. Yener N, Oktar GL, Erer D, Yardimci MM, Yener A. Bicuspid aortic valve. Ann Thorac Cardiovasc Surg 2002;8:264-7. Manivarmane R, Taylor R, Khattar R. Case of isolated bicuspid pulmonary valve. Echo Res Pract 2018;5:K13-8. Available from: http://www.ncbi.nlm.nih.gov/pubmed/29233813. [Last accessed on 2018 Feb 05]. Niaz T, Poterucha JT, Johnson JN, Craviari C, Nienaber T, Palfreeman J, et al. Incidence, morphology, and progression of bicuspid aortic valve in pediatric and young adult subjects with coexisting congenital heart defects. Congenit Heart Dis 2017;12:261-9. Sans-Coma V, Cardo M, Thiene G, Fernández B, Arqué JM, Durán AC, et al. Bicuspid aortic and pulmonary valves in the syrian hamster. Int J Cardiol 1992;34:249-54. Tretter JT, Steffensen T, Westover T, Anderson RH, Spicer DE. Developmental considerations with regard to so-called absence of the leaflets of the arterial valves. Cardiol Young 2017;27:302-11. Blaser MC, Wei K, Adams RLE, Zhou YQ, Caruso LL, Mirzaei Z, et al. Deficiency of natriuretic peptide receptor 2 promotes bicuspid aortic valves, aortic valve disease, left ventricular dysfunction, and ascending aortic dilatations in mice. Circ Res 2018;122:405-16. Li RG, Xu YJ, Wang J, Liu XY, Yuan F, Huang RT, et al. GATA4 loss-of-function mutation and the congenitally bicuspid aortic valve. Am J Cardiol 2018;121:469-74. Lin X, Liu X, Wang L, Jiang J, Sun Y, Zhu Q, et al. Targeted next-generation sequencing identified ADAMTS5 as novel genetic substrate in patients with bicuspid aortic valve. Int J Cardiol 2018;252:150-5. Giusti B, Sticchi E, De Cario R, Magi A, Nistri S, Pepe G, et al. Genetic bases of bicuspid aortic valve: The contribution of traditional and high-throughput sequencing approaches on research and diagnosis. Front Physiol 2017;8:612. Bobylev D, Breymann T, Boethig D, Ono M. Aortic root replacement in a patient with bicuspid pulmonary valve late after arterial switch operation. Thorac Cardiovasc Surg 2013;61:316-9. Angeli E, Gerelli S, Beyler C, Lamerain M, Rochas B, Bonnet D, et al. Bicuspid pulmonary valve in transposition of the great arteries: Impact on outcome. Eur J Cardiothorac Surg 2012;41:248-55. Khan SM, Sallehuddin AB, Al-Bulbul ZR, Al-Halees ZY. Neoaortic bicuspid valve in arterial switch operation: Mid-term follow-up. Ann Thorac Surg 2008;85:179-84. Jashari R, Van Hoeck B, Goffin Y, Vanderkelen A. 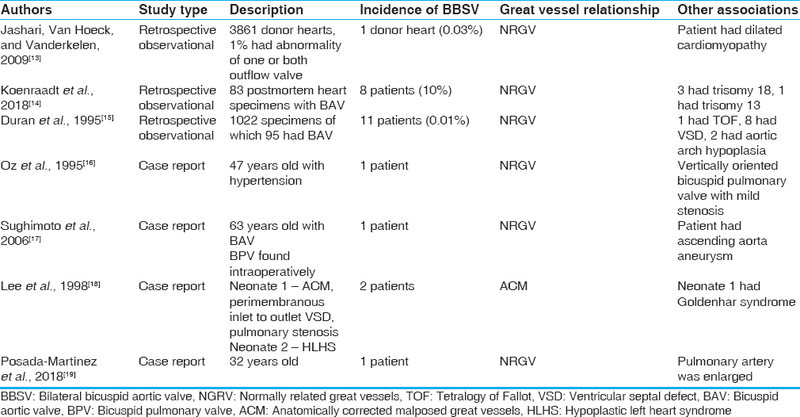 The incidence of congenital bicuspid or bileaflet and quadricuspid or quadrileaflet arterial valves in 3,861 donor hearts in the European Homograft Bank. J Heart Valve Dis 2009;18:337-44. Duran AC, Frescura C, Sans-Coma V, Angelini A, Basso C, Thiene G. Bicuspid aortic valves in hearts with other congenital heart disease. J Heart Valve Dis 1995;4:581-90. Kemaloğlu Öz T, Karadeniz FÖ, Gundlapalli H, Erer B, Sharma RK, Ahmed M, et al. Coexisting Bicuspid Aortic and Pulmonary Valves with Normally Related Great Vessels Diagnosed by Live/Real Time Three-Dimensional Transesophageal Echocardiography. Echocardiography 2014;31:218-21. Sughimoto K, Nakano K, Gomi A, Nakatani H, Nakamura Y, Sato A. Pulmonary artery aneurysm with ascending aortic aneurysm concomitant with bilateral bicuspid semilunar valves. Ann Thorac Surg 2006;82:2270-2. Lee ML, Chiu IS, Wu MH, Wang JK, Lue HC, Chaou WT, Tsao LY. Transarterial approach of the pulmonary artery in anatomically corrected malposition of the great arteries by manipulating a catheter inverted with balloon floating maneuver. Int J Cardiol 1998;67:1–7. Posada-Martínez EL, Arias-Godinez JA, Romero-Cárdenas Á, Ruiz Esparza-Dueñas ME, Fritche-Salazar JF, Rodríguez-Zanella H, et al. Coexisting bicuspid aortic and pulmonary valves diagnosed by 3D transthoracic echocardiography. Echocardiography 2018;35:423-4.